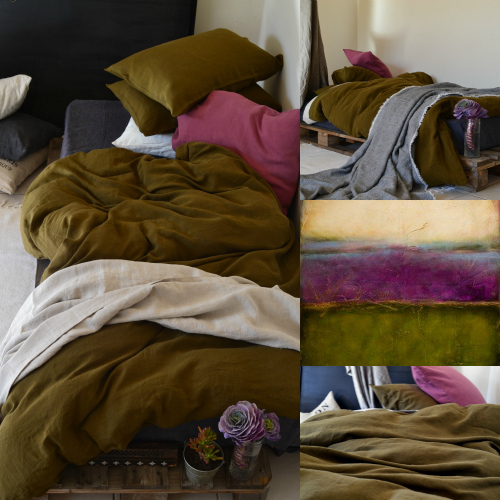 DARK OLIVE GREEN NATURAL STONEWASHED LINEN BEDDING: DUVET COVER AND SET OF MATCHING PILLOWCASES. Rich, deep saturated olive green linen bedding brings real warmth into bedroom interior. Genuine European medium weight stonewashed linen. Duvet cover closure with mother of shell buttons at the top bottom of the duvet. Amazing soft wrinkled linen texture. Set includes one duvet cover (choose your size from a menu) and x2 matching pillowshams, standard size (50x75cm)- simple "housewife" design, envelope closure at the back. Care instructions: normal machine wash, tumble drying on low heat, no ironing required to maintain relaxed and wrinkled texture. No dry cleaning. © 2015 House of Baltic Linen : all intellectual property, including images, designs and product descriptions protected by Australian copyright and remain the rights of the seller. They cannot be reproduced or altered in any way without obtaining written permission from the copyright owner. Queen size 210x210cm King size 245x210cm Super King 270x235cm US Full 80"x 80" US Queen 90"x92" US King 106”x92"